Editor’s note: Baja Zicatela is the strip on the less-traveled west side of the beach where new gourmet restaurants have started to pop up. Geographically, it starts with Cayuco and Samuray Sushi, on the beach side of calle del Morro, and then extends to Lotus and Fish Taco on the opposite side of the street. Nouvelle Oaxacan cuisine, made famous by restaurants like Origen, Pitiona and Casa Oaxaca in Oaxaca City, arrived in Puerto in November, and I think it will do much to elevate fine dining in our city. The two chefs — José Miguel Araña and Roberto Cruz Vásquez — both from Oaxaca — are creating new dishes based on traditional Oaxacan recipes from different regions of the state. Thus garnachas, a popular grilled meat dish from the Isthmus of Tehuantepec, are served with grilled fish here and well paired with an accompanying sour cabbage salad. Cayuco’s sauces stand out for the depth of their flavor. The catch of the day was pan-seared dorado marinated in locally grown spices and peppers, served with an adobo of chili costeño. 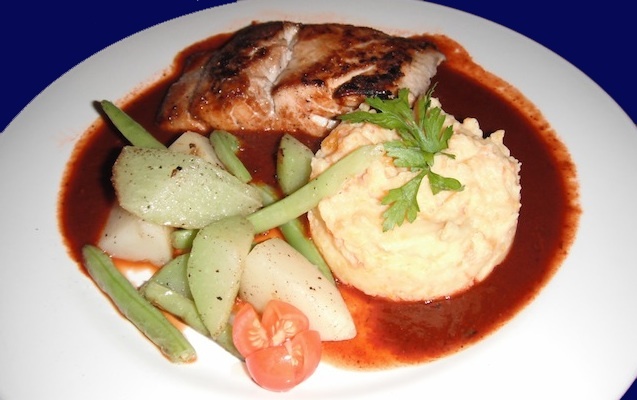 The fish came with mashed potatoes mixed with carrots and seasonings from the Isthmus and grilled vegetables. Truly delicious. Crickets (chapulines), which are a delicacy in Oaxaca, are another specialty. There is a grilled chicken breast with a chapulín sauce. Chapulines of all sizes are sautéed in oil that has been seasoned with chilis, garlic, lime and salt. I definitely recommend sampling Cayuco’s assortment of artisanal mezcals, not available any place else in Puerto. The very smooth arroqueño, with its distinctive bouquet, was a bargain at 70 pesos a shot, especially since it leaves you feeling happier than before. I didn’t get to sample the other offerings, but look forward to doing so in the future. For reservations, call Paulina at 954 120 4622. Open from 12 to 10 pm. Closed Mondays. Fresh-fish sushi, shrimp tempura, flash-fried chicken brochettes (Kushiage) and other Japanese delights cooked to perfection and served on the beach or under the palapa — could we ask for anything more? 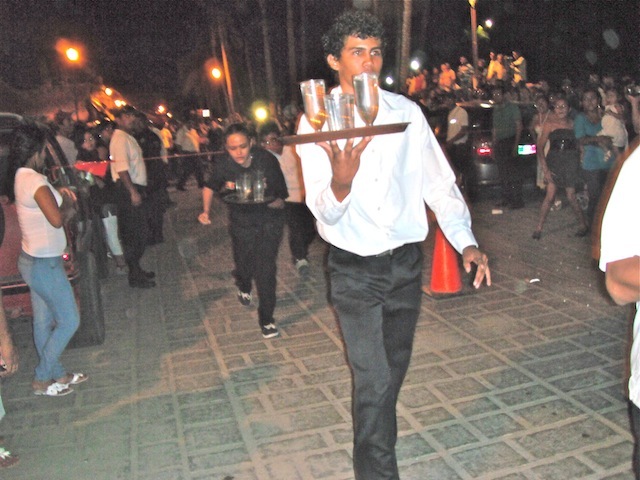 Wait, there is a more: a better-stocked bar than most in Puerto and a variety of cocktails. Better yet, happy hour is from noon to 7. And the Trio Fors performs every Friday at 7:30. The ambience is also worth a mention: Japanese lanterns flutter in the breeze. As befits the menu, a great deal of attention is paid to presentation. Chef and owner, Carlos Sánchez Vásquez studied Japanese cuisine at a culinary academy in Mexico City and apprenticed in Japanese restaurants there, but he’s not afraid to improvise. I recommend the California rolls made with fruits in season. The fresh pineapple and coconut roll was delicious. It’s not listed on the menu, you just have to know to ask the waiter. Another dish that I particularly like is the shrimp, cucumber, avocado and sesame roll. The shrimp tempura is another favorite; the shrimp is large and firm. 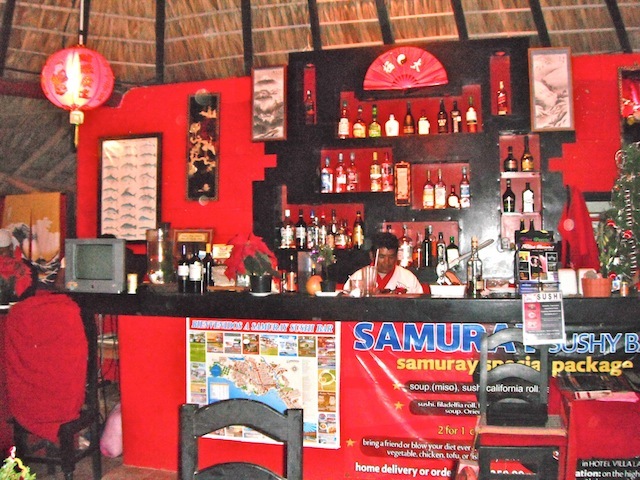 Samuray Sushi Bar used to be located on the other side of the highway, and moved to Zicatela in May. I’m glad to report that the food is just as before, but the new location makes the dining experience even better. Open 7 days a week. Breakfast from 8 a.m. to noon. Japanese food from noon to 11 p.m. When Lotus opened last winter, we all wondered if Canadian Dove Sussman could really pull it off. A restaurant that offered four very different kinds of Asian cuisine seemed like a stretch. I’m glad to say he succeeded. The menu features Indian, Thai, Vietnamese and Sichuan Chinese dishes and there is no confusion about which is which. Lotus grew out of Dove’s love for cooking. He realized that almost everything he needed for Asian cuisine was available, fresh at the local market. All that was missing were chefs who knew how to prepare these dishes. No problem, he found three sisters who were already proven cooks, and over a period of six weeks taught them the dishes. Dove still likes to work in the kitchen and is very much involved in the daily workings of the restaurant, even though he also has a movie theater, Cinemar, and a coffee shop, CaféChoc in Rinconada. Chicken Tikka Masala is one of India’s great contributions to world cuisine. Pieces of chicken are first marinated in a spicy yogurt sauce, grilled on skewers and combined with a thick, creamy curry. Lotus handles this very well. But I really loved the Vietnamese ginger fish. Fresh, thick dorado filets are steamed in bamboo baskets over fresh ginger. 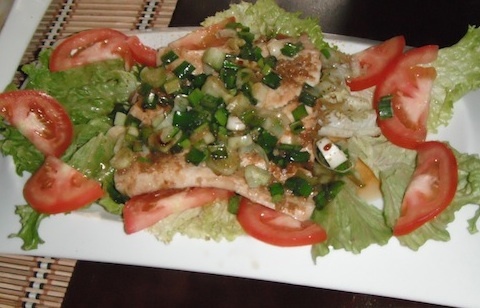 The fish is then topped with flash-fried green onions and a slightly salty sesame sauce. As I continued to explore the menu with the help of friends, I tried the Sichuan beef, another winner. The beef was thinly sliced rib eye, seared in a super hot wok to crispy on the outside and pink on the inside. The sauce was a spicy Sichuan sauce combined with carrots, onions and bamboo shoots. The Pad Thai noodle dish is also recommended, as well as the Vietnamese summer rolls. In fact, it’s hard to go wrong at Lotus. 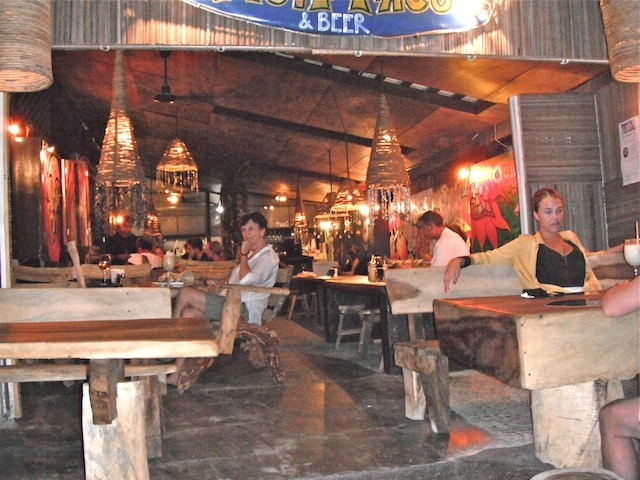 Open daily from 5 to 11 p.m.
What hits you first at Fish Taco is the hipster/surfer décor. There’s a spectacular mural by Julio Soto (the surfer seen on the cover of !Viva Puerto! #7) running the length of one wall, communal tables, strange looking chairs that are surprisingly comfortable and cool reggae in the background. Happily, the young, arty vibe is not off putting, as witness the number of retirees sharing tables with backpackers. The signature fish taco, is definitely not finger food. The fish or shrimp are prepared either tempura style in a very light batter or they are sautéed in garlic. Either way they are served with pineapple chutney, coleslaw and spicy sauces over a corn or flour tortilla. One 25-peso fish taco is a light meal, two are sufficient for a hearty appetite. Chef Antonio Vega trained at a culinary institute in New York, and he brings with him a sense of detail unusual for Puerto. There are two kinds of sushi roll: one coated with a mixture of bread crumbs and almonds, the other with toasted sesame seeds. Both are delicious. The Celestyle sashimi was a generous portion of mahi mahi marinated in citrus juices, olive oil and soy sauce. The presentation was exquisite featuring sliced red onion, shaved cucumber and pickled ginger; all surrounded by triangles of toasted focaccia. The “blue salad” was also visually appealing and very tasty. Wrapped in a circle of long, thin cucumber slices, were greens, a fan of avocado, toasted pecans, and blue cheese served with a balsamic vinaigrette. Breakfast at Fish Taco also takes you off the beaten track with Shakshuka, a North African dish of eggs, tomatoes, bell peppers and onions served with pita bread. This happens to be one of my favorite foods, and I think they prepare it better than I do. Open daily from 8 a.m. to midnight.